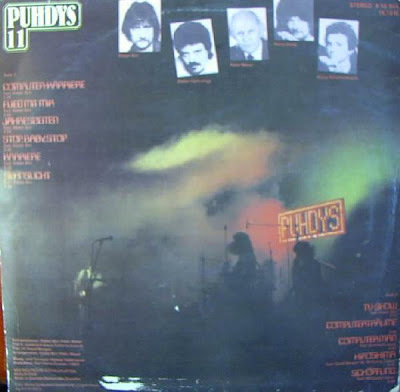 "Die Puhdys (pronounced [ˈpuːdis]) are a veteran German rock band, formed in Oranienburg, in what was then East Germany, in 1969, although they had been performing together, with various lineups, as the Puhdys since 1965. They continue to record and tour. 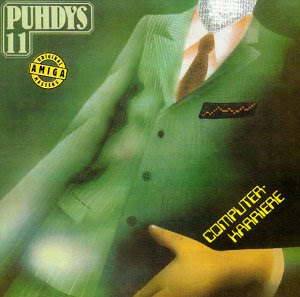 Although they are especially popular in their native eastern Germany, the Puhdys enjoyed significant success outside the GDR, and were one of the first East German bands allowed to tour West Germany. They are one of the most successful German-language rock groups." A very nice LP by this very important German band.In this LP their sound turns to a more electronic/synth pop style ,much influnced by the period's NDW sound. the first eleven years of my life i live in the gdr and die puhdys a not a thing which i´m very proud of. should i be proud? anyway. maybe this is interisting for you too. there are two electronic records. i only knows the zeiten Lp of lakomy which is not bad for the time and the place. one track is very good. Would really like to hear this, could you put it on Sharebee? Rapidshare doesn't work on my computer. Today i saw this Puhdys release in one book shop in Prague. I came in and heard funny stories about pronunciation of the band. At the very first moment i glanced the cover i remebered this one from mutant realm. i bought it for 85 czech crowns (thats aprox. 3,20 Euros) and realize that the owner of the shop doesnt even know about ebay. There is a collector coming there that is interested in czechoslovakia records of this and before era. If there is any request i can ask him! Yes, im enjoying electronic/synth edge of this record! Sehnsucht sounds pretty familiar. Anyway, thanks for all the other wonderful stuff you've been sharing - I keep being amazed by how little I know about so many interesting acts.